Clifton Adams is best known for his westerns, but he also wrote two of the best Gold Medal noir thrillers. 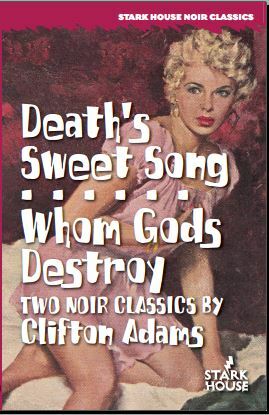 As August West said of Death’s Sweet Song in the Vintage Hardboiled Reads blog, "This may be the best crime fiction novel that Gold Medal published in the 50s." It’s got it all — a beautiful, conniving woman, a vulnerable safe, and a guy with lots of moral flexibility. Whom Gods Destroy is the story of a self-destructive bootlegger and the woman he can't forgive. Cullen Gallagher of the Los Angeles Review of Books provides a new introduction. Two of Gold Medal's FINEST crime stories written by one of their finest Western writers! Two vintage California novels from the author of Once a Thief and episodes of The Rockford Files. 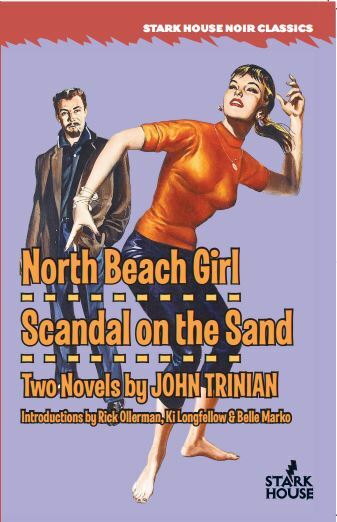 North Beach Girl is set in the world of San Francisco’s beatniks, and Scandal is the story of a dozen strangers thrown together on an isolated stretch of beach with a sadistic cop. As Ed Gorman reviewed it, "[Scandal] offers just about everything I ask for from a novel." In this superb coming of age story from the author of One for Hell, we meet 15-year-old Jeff Carr as he learns to cope with the harsh realities of life while growing up in Texas in the 1930's. 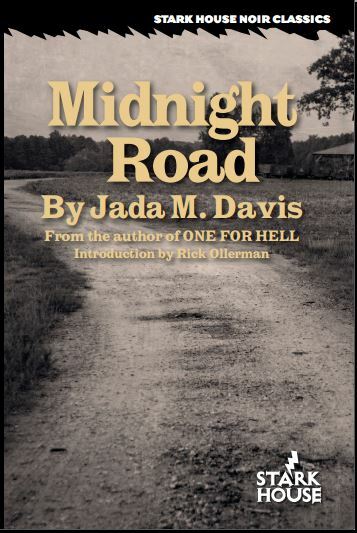 Filled with attempted murder, hidden secrets and family scandals, Midnight Road is proudly published here for the first time. Davis was a superb writer who only published two books in his lifetime. This is his third, uncovered by his son, Mark, and it is one of the best books you'll read all year. Really. How often can you marry noir and baseball in the same sentence? Don't count, but in honor of the spring return of the great sport of baseball, we're offering Arnold Hano's trio of noir novels for 20% off plus free shipping. What's the baseball connection? Hano knew Babe Ruth! And the man could write. As an editor he used to come up with plots and farm them out to writers like Jim Thompson. Hano is in his '90s now--clearly there's a lot he can look back on with pride. 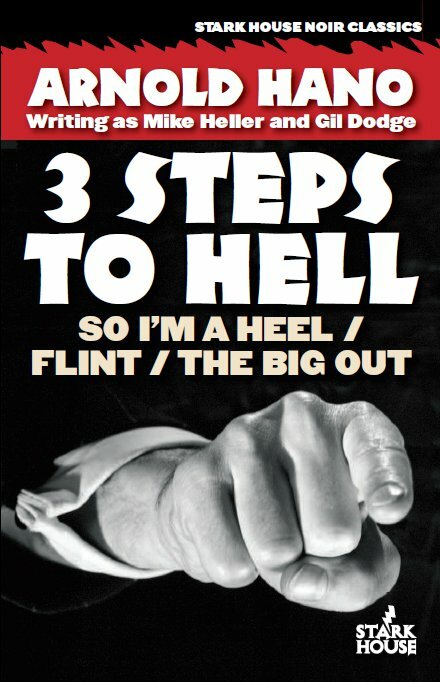 Three hard to find novels by writer and editor Arnold Hano, finally back in print and available to a wide market. Hano did most of his fiction writing under pseudonyms like "Matthew Gant" and "Gil Dodge" so the Hano name as a writer of noir fiction may be new to you. All three of these books center on different types of crime and all feature a different side of America, from a small town vet trying to make a mark, to a western noir novel based on the work of Jim Thompson (one of Hano's writers at Lion Books), and one from the heartland, where the pulse of the summer beats through the whole country in the closing weeks of a baseball pennant race. I don't know if anyone missed me, but it's been far too long for a Stark House newsletter. Family issues came to the fore and I've been out of pocket for much of the past month or so. Hopefully everyone's survived tax season with a smile on their face--if you didn't make money, you wouldn't have to pay taxes, right? So that's a good thing, right? That's called a teaser. More on the acutal SALE in a minute. First, though, for those of you who don't know, bookselling is unlike most other types of retail business. Books are mostly sold on consignment, just like those second-hand baby clothes places in every town in America. This means that when a bookstore buys a book wholesale, either direct from the publisher or from a distributor, they always have the option of sending the books back for credit. This is never any fun for publishers, of course, because not only does it make accounting difficult, indifferent shipping by various parties often result in having to refund money in exchange for books that are no longer in resellable condition. Books that do get sent back in good condition will typically go out again, but if orders have dried up for that particular title, the publisher may not wish to fill warehouse space with boxes and boxes of books that are not likely to move with any rapidity. Hence many books are pulped and recycled, and other times some are remaindered. Again, for those of you who don't know, these are the books with the magic marker slash marks across the top or bottom edges of those books you see on the "Bargain Books" table at your bookstore. This means that instead of anyone having to pay the expensive freight charges required to actually return the books, the publisher will give permission for the books to be remaindered. They must be marked a la the magic marker, which makes them ineligible for future return, and the publisher ends up treating them as a returned book that has been rendered into pulp. No royalties are paid on these books, either, since they don't officially count against sales. Who wins with this system? Well, readers do, because the consignment system allows stores to take many more titles than they may otherwise not be able to afford. "Bargain Books" shoppers benefit by being able to discover new authors at lower prices, making it much easier to take a flyer on someone they may have yet had a chance to discover. An author may not receive his royalty, but if he creates a fan, hopefully that reader will go on to buy his or her backlist of titles, and order that new hardcover when it comes out next Tuesday. Why am I talking about this here? Well, at Stark House we have a collection of overstock books, all in perfectly new condition, that need to find new homes. We could recycle them and return their pulp to the giant gene pool of future books, we could turn them over to a specialty remainder house to liquidate them, or we could save those freight costs and offer them to youse guys. And without that horrid magic marker squiggle. So here's the deal: send us an e-mail with your picks from the following list. There are no minimums and no maximums. Each book is a whole TWO DOLLARS, American. Buy a minimum of five books and you can pay A MERE BUCK APIECE. Normal freight rates apply, but they aren't high anyway. And we ship in cardboard, not plastic bags, padded or otherwise. One caveat, however: these books are all original Stark House editions. That sounds good until you realize that our regular proofreader, whoever he may be, did not work on some of these titles. Therefore, some of them may (and do) contain embarrassing typos. Some don't. So this is your fair warning. We'll give you a great deal on brand new books but if someone in chapter 13 jumps in their "ear" and zooms off, you have to not get mad at us. We do actually know the difference between an "ear" and a "car" and always have, even if it hasn't always shown. Three distinctive thrillers from the golden era of the paperbacks, all originally published by Gold Medal Books in the late 1950’s and mid-1960’s. New introductions by Charles Kelly and Ed Gorman. An all new Brewer novel, never before in print, together with one of his classic noirs from 1960 plus three rare short stories! Also included is a new introduction by David Laurence Wilson that discusses Brewer’s life. Two gangster noirs from one of the most important writers of the paperback original era. Donald Westlake described Anatomy of a Killer "as cold and clean as a knife...a terrific book." New introduction by the author's daughter, Dorothy Powell Quigley. Two excellent thrillers by the author of the "Nameless Detective" series, with a new introduction by Marcia Muller. "The people are real, the psychology is sound and the situation so inherently spellbinding that readers will be swept effortlessly along." -Seattle Post Intelligencer . The first two Whitney Logan mysteries set in gritty 1990's L.A. Includes a new introduction by Ken Bruen. James’s first novel, never before published in the U.S., plus a superlative collection of previously-uncollected short stories. “An unholy cross between Len Deighton and American noir novelist David Goodis.” –The Face. New introduction by the author. You can't go wrong with any of these titles, even though some may have some typos, but if you want to discover a writer you probably don't know and are a fan of hardboiled and gritty urban crime fiction, pick up the Russell James book. He's got one of those names that defies easy Internet searching but if you read his Underground and Collected Stories my guess is you'll want to seek out more.